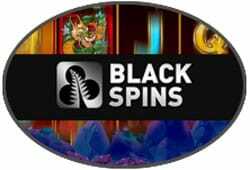 Black Spins is a new online casino that offers a variety of games. This includes standard and jackpot slots. It also includes roulette, blackjack and a selection of live casino games. Some of the standard slots include 5 Ninjas, Spinal Tap and Reels of Fire. The jackpot slots offered include Super Spinner Slots and Mega Jackpots Wolf Run. Players can choose from many automated games of roulette and blackjack. This includes Double Ball and Dolphins Roulette. Versions of automated blackjack offered include Blackjack One and Blackjack Silver. For a more interactive experience, players can try the live dealer games. These include Casino Hold Em, Speed Baccarat, Speed Roulette and Blackjack Grand VIP. What’s to get for new players? When a new player joins Black Spins Casino they can make a deposit immediately. The welcome package offered includes full or partial matches of a player’s first three deposits. Spins are also offered to new players depositing money. 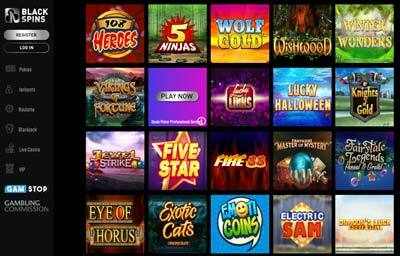 Any deposit matches players receive must be used on the casino’s games. Bonus money earns players more on some games than others. In the case of premium, slots, money bid makes a 75% contribution to meeting wagering requirements. These are the requirements put in place by the casino. Until the wagering requirements have been met, players can’t withdraw any of their winnings. Always make sure to read the full terms and conditions at the casino and check the current offer. Those who continue to make deposits may eventually qualify for VIP status. This can happen when players have met the overall minimum deposit requirements. The casino then invites them to become a VIP. If they accept, they can move up the ranks of the program. The levels of the VIP program are silver, gold, premiere and elite. Players at any level can receive withdrawals of their winnings much faster than others. Regardless of how often or how much players deposit, they have over a dozen options available. They include Visa and MasterCard, PayPal, Neteller, Paysafecard, Skrill and Trustly. While the casino has a minimum deposit amount, players are urged to set personal limits. Players can even set a daily deposit limit for themselves. The deposit option a player uses determines the maximum amount they can deposit within one day. There are strict rules about withdrawing winnings. The limit is one withdrawal every 24 hours. Players cannot withdraw any until they can prove their identity. And even when they do, it often takes several days to receive the money. The casino requires players to withdraw money the same way they deposited it. The casino also has guidelines and tools to help players gamble safely. This includes a feature called Reality Check. It allows players to limit the amount of time they spend on Black Spins Casino. If a player reaches his or her time limit during a game, a message appears on the screen. Players can then exit the game if they want to. Otherwise, the casino continues to track the amount of time a player spends on a game. In this way, the casino helps players enjoy it responsibly. Doing so benefits the casino and its players.